There are a number of women involved in the technology industry, an industry which is made up of predominately men, and I wanted to point out a few 'women in technology' movements. I was instantly intrigued when I heard about a site formerly known as Dig A Silicon Valley Girl now named more broadly as Dig A Tech Girl. 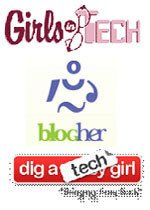 The site leverages Digg-like voting features to rate photos of women that work in the technology field. It is like a "Hot or Not" approach to judging the women of technology. Bub.blicio.us has highlighted some of the women you might know. "A dynamic mixture of women working to empower the next generation of leaders"
"Create opportunities for women who blog to pursue exposure, education, community and economic empowerment."